Only English map from the Jansson Visscher series. Map reveals the rapid Anglicization of the region following the 1665 British takeover of New Amsterdam / New York City. A Map of New England and New York. A fine example of the esteemed 1676 map of New England issued in the Basset and Chiswell edition of John Speed's Prospect of the Most Famous Parts of the World. Following in the Jansson-Visscher model, this map covers from the coast of Maine in the vicinity of Penobscot to the Delaware and Chesapeake Bays. This, we might add, is marked departure from the model which typically also includes Virginia. The cartographer does the intentionally, having introduced another map which specifically details Virginia. Although commonly referred to as the 'Speed Map of New England' for its publication in the Prospect of the Most Famous Parts of the World, this map was not drawn by Speed at all. In fact, John Speed had been dead for some 47 years before it was issued. After Speed's death his map plates fell into the hands of Thomas Bassett and Richard Chiswell. Bassett and Chiswell employed Francis Lamb and others to engrave seven additional maps, three dealing with North America, to expand the Speedian Prospect. This is one of those three. The map is richly engraved and embellished in the Dutch style with various 'American' fauna frolicking in the hinterlands. These include a deer or elk, a catamount, several beavers (important given the primacy of the regional fur trade in the mid-17th century), cranes, and foxes. Topography is presented in profile and often speculative. Two elaborate title cartouches appear in the lower right quadrant illustrating the map's scale, bearing the title, and the Bassett and Chiswell imprint. Francis Lamb's imprint appears between the two cartouches. This map was engraved by Francis Lamb for Bassett and Chiswell and while sold separately as early as 1675, but appeared in only one edition of the atlas, 1676. 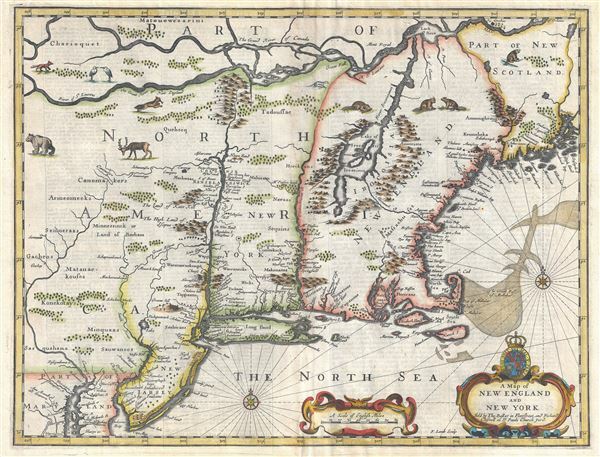 There is only one edition of this map and most, like our example, have English text on the verso describing New England. Other variants without text on the back lead Burden to speculate that there may have been a later printing between 1686 and 1688 under Robert Walton or Christopher Browne. Francis Lamb (fl. 1667 - 1701) was an English engraver and mapmaker active in London during the second half of the 17th century. Working as an engraver Lamb produced a number of highly influential maps including four plates of the New World for inclusion in the 1676 Basset and Chiswell edition of Speed's "Prospect of the most famous parts of the world". He worked in conjunction many of the most prominent English map publishers of the 17th century including Richard Blome, John Seller, John Ogilby, Robert Morden, William Berry, Moses Pitt, Philip Lea, among others. Little is known of Lamb's personal life however he seems to have been a pupil of the British polymath Robert Hooke, who mentions him regularly in his journals. The dates of Lamb's birth and death are unknown, there is some speculation that he may have died around 1717. Speed, John, Prospect of the Most Famous Parts of the World, (London: Bassett and Chiswell) 1676. Very good. Extremely minor older centerfold reinforcement to lower margin not affecting printed area. Plate mark visible. English text on verso. Burden, P., The Mapping of North America II, #455. McCorkle, B. B, New England in Early Printed Maps 1513 - 1800, #676. New York Public Library, Map Div. 01-5126. Campbell, T., 'The Jansson-Visscher Maps of New England', The Mapping of America (Tooley, R. V.), no. 23.